The sophomore edition of our D’SCENE Magazine is ready for a next week release and we are giving you the first taste of the new chapter with a story photographed in Berlin. Fashion photographer Christoph Musiol has teamed up with fashion stylist Bodo Ernle at Nina Klein for the session captured during Berlin Fashion Week. The new issue for us presents the best of the new generation of models, designers and young creatives, all of them we can simply describe as the Brave New World. 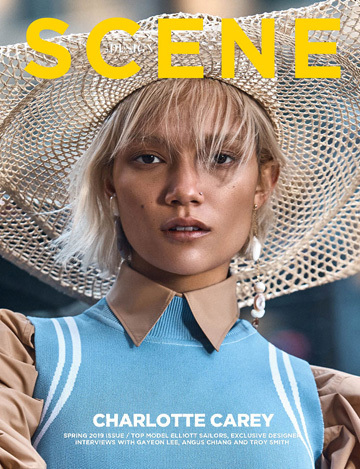 With some of the most promising models on the scene the story shot for our print edition also features hair styling and makeup by Mischka Hart at Basics and Anna Ploch at Nina Klein. Star of our first D’SCENE #02 issue teaser is top model Stefan Pollman at Modelwerk model agency, who is wearing a coveted sweater from IVANMAN and trousers from Topman. Stefan is also represented by Re:Quest Models in New York, Why Not Model Management in Milan, Next Model Agency in London, Sight Management Studio in Barcelona, Modelwerk in Hamburg, and Two Management in Los Angeles. You can keep up with Stefan through his instagram @stefan_pollmann.